High Efficiency Stirling Engine Key to Energy Conversion, a feature article about Sterling Energy System's solar dish system, appeared in the January 9 issue of Design News . Quite an interesting article for those of you that are interested in the details of how the system is made. 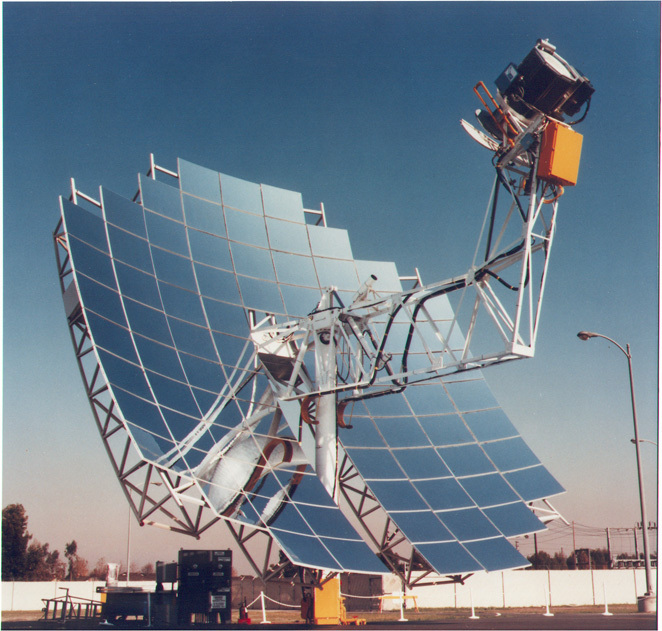 Their dish/engine concentrating solar power system uses a mirror in the shape of a dish to collect and concentrate the sun's heat onto a small area where a receiver is located. The receiver transfers the sun's energy to a Stirling cycle engine, that converts the energy into power. Dish/engine concentrating systems were the subject of this earlier post. The article goes into quite a bit of detail about the mechanical design of the system, which I have not seen anywhere else. It explains the Stirling cycle, the Stirling engine that they are using and gives quite a bit of detail about the mechanism that is used in the tracking system they use to position the dish so that it follows the position of the sun.